The United States International Trade Commission (USITC, or just ITC) has just given notice of its decision to extend (once again) the target date for its ruling on Samsung's complaint against Apple. The highly-anticipated ruling, which will most likely require the ITC to take a position on FRAND licensing issues for the first time in a final determination, is now scheduled to come down on Tuesday (June 4). In mid-March the ITC had previously postponed the resolution of this case, setting a target date for today (May 31) and raising questions specific to a FRAND-pledged standard-essential patent, Samsung's U.S. Patent No. 7,706,348 on an "apparatus and method for encoding/decoding transport format combination indicator in CDMA mobile communication system", which is allegedly UMTS-essential. The nature of the questions and the fact that they were asked at such a late procedural stage indicated that the ITC has most probably identified an infringement of the '348 patent. The commercial impact of an exclusion order (i.e., import ban) on Apple would be rather limited. Samsung has already stated affirmatively that it's not accusing Apple products incorporating a Qualcomm baseband chip but only older iPhones and iPads. The iPhone 4S was Apple's first Qualcomm-based handset. The most interesting question is what position the ITC will take on FRAND-pledged standard-essential patents (SEPs). In the build-up to the just-postponed decision, four U.S. Senators and four U.S. Representatives had written letters to the ITC to reiterate lawmakers' concern over the anticompetitive and anti-innovative implications of import bans over FRAND-pledged SEPs. Apple claims that Samsung brought its ITC complaint prior to making any licensing offer, let alone one on FRAND terms. Samsung has responded to Apple's claim, but its denial is heavily-redacted. There is clearly a trend in the U.S. toward resolving disputes over FRAND-pledged SEPs in district court, which (unlike the ITC) can determine FRAND licensing terms if the parties fail to reach an agreement. Last month the United States District Court for the Western District of Washington handed down a landmark rate-setting decision in a Microsoft v. Motorola Mobility contract case. Early last week the United States District Court for the Northern District of California barred a SEP owner from enforcing a potential ITC import ban pending the FRAND rate-setting action in that court. While this ruling on Samsung's case has been postponed several times, Apple needs even more patience in its own ITC case against Samsung. Apple's complaint was filed only a couple of weeks after Samsung's, but the final Commission ruling is scheduled for August 1, 2013 -- almost two months after the new target date for Samsung's case against Apple. Should Google convince the court at the October retrial that Microsoft's patent-in-suit (EP0845124 on a "computer system for identifying local resources and method therefor") is highly likely to be invalidated by the Federal Patent Court in a parallel proceeding, then the case may be stayed pending the nullity proceedings. Otherwise an injunction is very likely. As I just explained in connection with a Mannheim decision to reopen a VP8-related infringement case, German courts don't reach the question of (in)validity unless there is a finding of infringement. There are some procedural differences between the approaches of the Mannheim Regional Court and the Munich I Regional Court: the Munich court always holds at least two hearings (the second one is a trial), while Mannheim holds only one. The statement by the Munich court concerning Google Maps says that the focus at the retrial would be "mainly" on the question of (in)validity, which is a strong indication of a likely infringment finding, Judge Voss did not indicate at today's announcement in Mannheim regarding VP8 that there would be any other issue on the agenda of the reopened proceedings than (in)validity. A Google Maps ban in such a large market as Germany would put major settlement pressure on Google. Google's counsel urged the court in March not to order an injunction, or at least to enable Google to avert enforcement by giving security. The court is aware of the commercial implications of this case in the context of the wider global dispute between Microsoft and Google. Google got its day in court in March (the trial lasted more than six hours, which is about three times as long as most German patent infringement trials), and it will get another day in court in October. Then there will be a decision, and any other outcome than an injunction or a stay pending the parallel nullity action is extremely unlikely based on where things stand today. Google purchased Motorola Mobility for $12.5 billion in hopes of leveraging its patent portfolio against Apple, Microsoft and other companies who might bring infringement claims against Android, but the deal has failed to pay off for Google. A week ago the United States International Trade Commission (USITC, or just ITC) tossed Motorola's complaint against Microsoft's Xbox. A month earlier it had already thrown out whatever little was left of Motorola's complaint against Apple. And a federal district court concluded at the end of an in-depth analysis that Motorola Mobility's standard-essential patents don't contribute enough to Microsoft's products (Windows, Xbox) to justify a substantial FRAND royalty. In other words, Google isn't able to force Apple, Microsoft or anyone else to settle. The only question is when it will realize that it needs to take a royalty-bearing license from Microsoft (just like pretty much every third-party Android device maker) and agree on some kind of settlement, probably involving an anti-cloning provision, with Apple. For the time being, Google prefers litigation over licensing. But licensing will be the outcome, sooner or later, before or after the Munich retrial over Google Maps in October. This morning -- right before an HTC v. Nokia trial over a power-saving patent allegedly infringed by Lumia phones -- Judge Andreas Voss ("Voß" in German) of the Mannheim Regional Court announced a procedural decision in the first Nokia v. HTC lawsuit involving Google's VP8 video codec. The court has reopened the proceedings in order to take an even closer look at the validity of this patent with a view to a decision on whether to stay the case pending a parallel nullity (invalidation) action before the Bundespatentgericht (Federal Patent Court). While Judge Voss did not explain the reasons for this decision at today's announcement other than referring to a post-trial brief on (in)validity, there's every indication that the court has identified an infringement of EP1206881 on an "apparatus and method for compressing a motion vector field" in the aftermath of the March trial. Under German bifurcation rules, there is no full invalidity defense in an infringement proceeding. Defendants challenging the validity of a patent-in-suit must do so at the (Munich-based) Federal Patent Court, while infringement cases are adjudged by regional courts. Infringement proceedings are frequently adjudged ahead of nullity cases (particularly in a court like Mannheim, a rocket docket for patents), but a regional court can stay an infringement case pending resolution of the nullity action if, in its assessment, there is a high likelihood of invalidation. If it finds no infringement, it dismisses a case immediately and never reaches the question of (in)validity. Once it identifies a first infringement, it immediately interrupts the infringement analysis (if there are other infringement theories -- such as claims against different technologies -- at issue) and focuses on the possibility of a stay pending the nullity case. In light of the above, the reopening of proceedings to further evaluate the question of (in)invalidity is most likely attributable to an infringement finding. At the very least there has been a finding of likely infringement. If the court disagreed with Nokia's infringement claims, it would dismiss the case rather than waste court and party resources on the analysis of a question that would never have to be reached in that scenario. Google, to which this case is of far greater strategic concern than to HTC, is an intervenor in this case. For Google's aspirations to elevate VP8 to an Internet standard, an infringement finding by the most experienced court in the world with respect to information and communications technology patents would be a huge setback. Even if the court stayed the case over doubts concerning the validity of the patent-in-suit, an injunction could enter into force if and when Nokia successfully defends this patent in the proceedings before the Federal Patent Court. For HTC a stay would be great because it would likely settle its dispute with Nokia before a final decision on the validity of this patent -- but Google needs a dismissal, which it didn't obtain today and appears unlikely to obtain later this year. It's unclear whether there will be a second trial to discuss the new invalidity contentions that resulted in the reopening of the proceedings. It's also possible that the court will decide after further briefing, without another hearing. Google's problem with Nokia's opposition to VP8 won't go away anytime soon. The next VP8 trial will be held by the same court in two weeks from today, and last week Nokia brought a third patent infringement claim against VP8 through a new ITC complaint. All in all Nokia identified to the Internet Engineering Task Force (IETF) a total of 64 patents and 22 pending patent applications that allegedly read on VP8. Nokia can't sue over the 22 applications unless and until a given application is granted, and the 64 patents don't represent 64 different inventions (it's a per-jurisdiction count). While a negative ruling (unless reversed on appeal) in one jurisdiction would make it more difficult for Nokia to prevail over the same patent in other European countries or over other members of the same patent family in non-European jurisdictions, courts in other countries (including other European countries) are still free to disagree with the first ruling. It's not known at this stage whether there are other companies than Nokia who may assert patents against VP8 in the future. Google did a deal with 11 patent holders affiliated with MPEG LA, but there could be others. Some may be interested only if VP8 becomes an Internet standard and, as a result, is used more widely than today. And the MPEG LA deal is controversial: the FRAND-zero patent license Google proposes is not palatable to key players in the open source movement. The Software Freedom Law Center welcomes it, but the explanation it provides would equally apply to Microsoft's Android and Linux patent license deals, which Google doesn't like at all. Unless the Mannheim court has changed its procedural approach to patent infringement cases with parallel nullity actions since the explanations Judge Voss gave last year (which is very unlikely), today is a Black Friday for VP8. Google-funded anti-IP groups support Google against Oracle's copyright appeal -- is that it? BRIEF TENDERED from Computer & Communications Industry Association Title: Brief Amicus Curiae in Support of Cross Appellant Google Urging Affirmance. BRIEF TENDERED from Computer Scientists Title: Corrected Brief of Amici Curiae Computer Scientists In Support of Defendant-Cross Appellant and Affirmance. 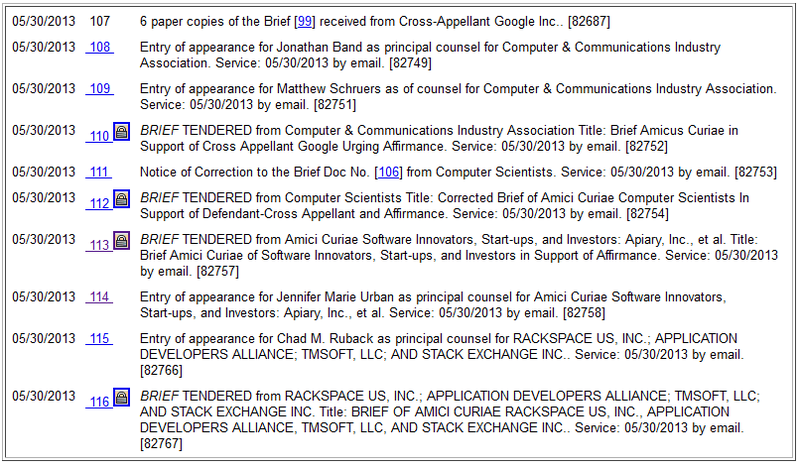 BRIEF TENDERED from Amici Curiae Software Innovators, Start-ups, and Investors: Apiary, Inc., et al. Title: Brief Amici Curiae of Software Innovators, Start-ups, and Investors in Support of Affirmance. 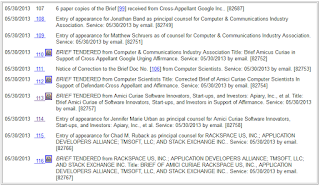 BRIEF TENDERED from RACKSPACE US, INC.; APPLICATION DEVELOPERS ALLIANCE; TMSOFT, LLC; AND STACK EXCHANGE INC. Title: BRIEF OF AMICI CURIAE RACKSPACE US, INC., APPLICATION DEVELOPERS ALLIANCE, TMSOFT, LLC, AND STACK EXCHANGE INC.
Google is a driving force behind the CCIA. It has various other members, but there is no other member that the CCIA would have supported as consistently and aggressively in a variety of IP contexts in recent years as Google. BSA | The Software Alliance, whose amicus brief supports Oracle, also counts Oracle among its members, but it hasn't previously appeared as a pro-Oracle lobbying entity the way CCIA has been a pro-Google lobbying entity over the last couple of years. Oracle also received direct support from sizable companies (Microsoft, EMC, NetApp). And BSA's membership represents a far greater share of of software innovation in the U.S. and on a worldwide basis than that of CCIA (particularly if you remove Microsoft from CCIA's list, given that Microsoft took a clear position in Oracle's favor in an amicus brief it filed directly). The "Computer Scientists" are represented by the Electronic Frontier Foundation (EFF), which orchestrated this brief. The EFF has received various donations from Google, three of which were mentioned by the BBC, including a de facto donation amounting to a million dollars (in a class action settlement it was given a choice to whom to give money and, of course, picked the EFF, which it had already funded before). It published pro-Google articles (on its own website and on Wired) during the trial and argued that the need for the open source Samba file server to interact with Microsoft's products supported the case for non-copyrightability of interoperability-related code, when the fact of the matter is that (true) interoperability can be ensured through "fair use" and, which happened in the Microsoft-Samba case, antitrust regulation. "It is safe to say that all software developers use APIs to make their software work with other software." Why is this disingenuous? Because it suggests that all software developers are at risk from litigation if APIs are found copyrightable. But those using an API for its intended purpose have nothing to fear -- only those who copy and steal. The copyrightability of APIs doesn't create legal risks for those building applications on top of a platform. Nowhere does Oracle say in this dispute that Google isn't allowed to write Java apps. Also, the EFF is generally known to advocate anti-IP positions, which the Federal Circuit (a key protector of IP) is pretty aware of. There are areas in which I agree with the EFF. In particular, I believe small app developers shouldn't be targeted by patent trolls. The list of "Computer Scientists" undoubtedly includes people whose names ring a bell with me, such as Bjarne Stroustrup, who invented the C++ programming language a long time ago when there was less computing power in entire data centers than there is in a modern-day smartphone. But that's not a substitute for support from corporations. If you get hardly any corporate support except from one of your own lobbying fronts (CCIA), then you know that your positions aren't popular in the wider industry. But there's another reason why even the impressive backgrounds of some of those "Computer Scientists" are of limited relevance to the weight of this amicus brief: it's a lot easier for an organization like the EFF to persuade people to lend their name to such an effort than it is to convince the sophisticated legal departments of large organizations. You can get individuals to sign up by somehow making them believe there's an important cause to support, or by spreading FUD. This is very hard to do with large corporations. And that's the reason why some of those individuals can only support Google in their own name and can't persuade substantial organizations they know or work for to join this effort. For now the "Software Innovators, Start-ups, and Investors" haven't been identified except for "Apiary, Inc.". If you enter "apiary" in Google, you'll get all sorts of results, but it's hard to find this company. It remains to be seen who else is on this list, but again, the level of sophistication when it comes to complicated IP issues is probably very low compared to the legal departments of the kinds of organizations supporting Oracle. These may be just the kinds of people the EFF managed to mislead with its public call. Earlier this month Rackspace filed an amicus brief together with Google against Apple's pursuit of a permanent injunction against Samsung (which took positions that are contrary to what Chief Judge Rader wrote in a very recent ruling). Rackspace is a great service provider, but it really can't speak on behalf of innovators. The EspaceNet database lists a total of nine Rackspace patent applications. It's no surprise that this company is in favor of weak IP: it would love to exploit what others have created. The Application Developers Alliance has no reason to be concerned about infringement through the creation of apps, as I explained further above, but the EFF may have misled the organization and some of its members, though strong copyright can actually help little guys defend themselves against large players (regardless of whether this means Apple, Google, IBM, Microsoft, Oracle -- you name them). What the Application Developers Alliance may primarily worry about is that if Oracle succeeds, hundreds of thousands of Android apps may have to be rewritten as a result of Oracle's efforts to "bring Android back into the Java fold". I understand that app developers prefer not to rewrite software only because the underlying platform has IP issues. But that is not a reason to deny copyrightability or to define "fair use" so broadly that infringers easily get away with their conduct. In previous posts (1, 2) I already wrote that amicus briefs are not only about what is said but also about by whom it is said. Oracle received support from substantial organizations as well as from individuals (such as former U.S. copyright chief Ralph Oman) who are very sophisticated in the IP context. Oracle received independent support from such amici. And Oracle's supporters showed a credible basis for being profoundly concerned about the implications of the district court's ruling. By contrast, Google has had to use organizations it funds in order to drum up the appearance of support, may have confused well-meaning individuals and small companies about what's truly at stake here, and the motives of supporters like Rackspace, whose business model is about the commercial exploitation rather than creation of IP, are also questionable and not likely to appeal to the Federal Circuit judges. After many years of fundamentalist opposition to patent licensing it appears that Free Software advocates have become more pragmatic and now, at long last, tend to appreciate the benefits of patent license agreements and recognize what they usually denied in "open standards" policy debates around the world: that FRAND licensing terms for patents that read on Free and Open Source Software (FOSS) can actually contribute to the freedom of software distributors and users. "Because the patent license does not restrict those freedoms, but rather affords some new, limited protections to users and developers within the field of use, it improves on the current situation. Without this license, the patent holders would be in a position to threaten those users and developers as well as others. [...] [U]ntil software patents no longer threaten FOSS, we will look for every opportunity to preserve community development from their destructive effects. The VP8 cross-license provides such an opportunity, in an area of particularly active patenting." This is, in fact, a ringing endorsement of Microsoft's patent license agreements with Android and Linux device makers (note that Android includes Linux, which is distributed under the Free Software Foundation's GPL license). Last month ZTE became the 20th Android device maker known to have taken a royalty-bearing Android patent license from Microsoft, and Microsoft previously announced license deals involving non-Android variants of Linux (examples: Amazon, Brother, Casio, Kyocera, LG, Samsung). Just like the proposed VP8 patent license is a separate license from the software copyright license, Microsoft's Android and Linux patent license agreements are separate from the copyright licenses governing the open source distribution of Android/Linux. Just like the licensees under Google's proposed VP8 license, Microsoft's licensees are "not [...] required to pass on any restrictions limiting users' rights to copy, modify, and redistribute free programs" (if Samsung et al. imposed any such restrictions, we would know). Instead, users "have the same rights as they would if the [device makers] had never accepted the patent license". Just like video codecs are "an area of particularly active patenting", so are smartphones (which according to patent aggregator RPX potentially infringe a quarter million patents). In fact, smartphones are an area of far more active patenting because they include video codecs but also numerous other technologies in fields of active patenting. Just like the proposed VP8 license, Microsoft's Android and Linux patent license agreements "do not restrict [FOSS] freedoms, but rather afford some new, limited protections to users and developers within the field of use", which in the SFLC's opinion "improves on the current situation". Of course, the terms of Microsoft's agreements with Android/Linux device makers aren't known -- nor are the terms of Google's agreement with 11 MPEG LA patent licensors. All that we can see from the outside is what the respective licensees do or don't do. Do they impose restrictions? No. Do end users have to pay separately? No, someone takes care of this for them. Does this mean third parties can do anything they want without possibly needing a new license from the relevant patent holders? No. Nor are they free to "do anything" under the VP8 patent license agreement. With a vocal part of the Free Software ecosystem agreeing that patent licenses are preferable over litigation, and confirming that patent licenses wich don't result in a modification of software copyright licenses actually "afford some new, limited protections to users and developers within the field of use", licensing is more popular than ever. Once Google's Motorola Mobility also takes such a patent license, it will be difficult to come up with anyone else who could lend a meaningful endorsement to this commercial practice (which is also accepted in all other fields of technology). HTC and ViewSonic continue to defend themselves vigorously and, so far, effectively against Nokia's patent infringement lawsuits in Germany. Today the Munich I Regional Court held a second hearing (tantamount to a trial) on Nokia's assertions of EP0982959 on a "mobile telephone user interface for short messages" against HTC and ViewSonic. The court had held separate first hearings (ViewSonic in November, HTC in January). At the outset of today's joint trial Judge Andreas Mueller ("Müller" in German), who presides over one of two chambers (panels) hearing patent infringement cases at this court, outlined the court's preliminary views, based on which there would be a finding of no violation. The primary issue Nokia faces in the claim construction and infringement analysis in this case is that the patent refers to "folders" in which text messages (SMS) are stored upon receipt and from which they are retrieved for a threaded display, while HTC and ViewSonic's Android-based devices store incoming messages in an SQLite database and retrieve them by a thread ID at the time of displaying. Nokia already argued at the first hearings (see my reports, which I linked to further above) that there is no relevant functional difference, and filed additional arguments and evidence in the meantime, but at least at the outset of today's trial Judge Mueller and his two colleagues still believed that the patent does not give Nokia monopoly rights over the functionality as seen by end users -- in the court's preliminary opinion, the patent is specific to a particular way to organize data, and a file system is considered something else, even for the specific purposes of this patent, than a database. Nokia tried hard to persuade the court of its broader interpretation of the patent, but when the ruling comes down in two months it's probably going to be a finding of no infringement. Judge Mueller's court has a reputation not only for narrow claim constructions but also for applying his claim constructions narrowly to the accused technologies. I can't think of a more difficult panel of judges in Germany when it comes to infringement. This also affects invalidity contentions, which rarely meet the threshold of a high likelihood of invalidation in Judge Mueller's eyes. Nokia's functional perspective on this patent is reasonable, and it will be interesting to see the appeals court's position at some point. At the same time I wish to point out that in all of the Nokia v. HTC cases I watched I haven't seen any indication of HTC deliberately infringing Nokia's intellectual property in terms of clear and reckless copying. Nokia was an industry leader at a time when hardly anybody knew about HTC (and those who did viewed it as more of a manufacturing company). As a result, Nokia owns patents that cover technologies today's devices implement, though in some cases this depends on claim construction. In March Nokia won a first German injunction against HTC over a power-saving patent and it still has a number of cases pending in three jurisdictions (U.S., UK, Germany). Given the breadth and depth of Nokia's patent portfolio it's unlikely that there's nothing in it that HTC needs to license -- but for the time being HTC believes it's a better choice to litigate than to sign a deal. In my opinion, both companies' actions appear legitimate. Not only is HTC defending itself but it's also countersuing Nokia over a couple of patents of its own (including a patent belonging to wholly-owned HTC subsidiary S3 Graphics). The Mannheim Regional Court will hold an HTC v. Nokia trial on Friday. On that same day the ITC will commence an evidentiary hearing (i.e., trial) on Nokia's complaint against HTC. "[T]o the extent that merger occurs because a program element becomes an industry standard, the loss of intellectual-property protection over time is nothing new. The same issue arises when a formerly distinctive trademark like 'Aspirin' or 'Thermos' eventually becomes a descriptive, generic designation that competitors 'must be free to use if they are to be able to enter the market.'" It's quite a leap to apply this logic from trademark law to copyright law, and last time I checked Oracle didn't assert the Java trademark against Google. Many of Google's key arguments in the copyrightability context will be irrelevant if the Federal Circuit determines that what's copyrightable is copyrightable, and always will be, for substantive reasons. Google's lawyers' favorite word is "dictated" as in "dictated by an external factor" or "dictated by the function to be performed". That's a cornerstone of Google's anti-copyrightability argument: functional elements must be filtrated out regardless of how original or creative they are, and Google continues to claim that interoperability is a reason for denying copyrightability. In addition to the previous point (separating fair use and compulsory-licensing questions from copyrightability), the whole notion of 7,000 lines of API definitions being "dictated" makes no sense whatsoever if the appeals court determines that what matters for copyrightability is the creative freedom Oracle/Sun enjoyed when originally creating Java -- as opposed to the freedom Google enjoyed after it decided that it wanted to attract many Java programmers to Android. Google's brief relies (not only, but primarily) on three cases with respect to copyrightability: Sega v. Accolade, Sony v. Connectix, and Lotus v. Borland. Google has a problem if the Federal Circuit, unlike Judge Alsup, finds them inapposite because Sega and Sony are fair use cases that don't provide any detailed copyrightability analysis that would help decide the Android/Java case, and because Lotus was about a menu structure (very small and simple compared to the Java APIs). "if the Court reverses the copyrightability judgment, it should direct the district court on remand to retry Google's fair-use defense (as well as the inseparable issue of infringement)." This may be a useful reminder to all those who, even in recent months, erroneously wrote in articles and commentary that Oracle had lost in district court on two grounds, copyrightability and "fair use" -- in reality, "fair use" was simply not resolved because the jury was hung, and once Oracle prevails on copyrightability, it will have to be resolved somehow: by the appeals court, by the district court, or by another jury. As long as Oracle hasn't prevailed on this count, it can't get an enforcement ruling, but as long as Google hasn't prevailed on it either, this particular defense hasn't succeeded. This case is far from over, and Google has to deal not only with Oracle's opening brief but also some highly informative and persuasive amicus curiae briefs (overview of amici, former U.S. copyright chief's warning against eviscerating protection for software, Sun founder's submission explanatory filing by academics regarding API creativity, filings by organizations representing creatives). "The Java Application Programming Interface ('API') is not a work of imaginative fiction." This is an allusion to the Ann Droid/Harry Potter analogy in Oracle's opening brief. Google's brief also mentions Harry Potter in a couple of contexts, claiming that fictional works are different. I don't think Oracle denied differences at the creative level, but Oracle's Harry Potter analogy is mostly about the commercial implications of plagiarism (at least that's the way I understood it). "[Harry Potter's] chapter headings and topic sentences exist entirely for communicative and aesthetic purposes--not to 'bring about a certain result' when used in a computer." If everything that brings about a certain result when used in a computer were excluded from copyrightability, no software would ever receive protection. "Oracle accuses the district court of practicing 'software exceptionalism'--discriminating against software by granting it less protection than other works. But it is Oracle that seeks an exception here by asking the Court to excuse the Java API from the normal rule of 'thin' protection for functional works." I would agree with Google on this one if, for example, Oracle claimed that a single function definition like for the "max" function should be copyrightable. In that case, copyright trolls would give programmers far more headache than patent trolls because software copyright would then be as broad as the broadest patents, or even broader. But Oracle only argues that thousands of lines of API definitions aren't for the taking. In my view, even "thin" protection has scope for this. "Was Google's use of eight decompiled test files and nine lines of rangeCheck code de minimis and thus non-infringing when compared to the 2.8 million lines of code in the class libraries of the registered Java 2 SE version 5.0 platform?" I'm not going to defend the rangeCheck decision, and frankly, I don't care about it too much. As for the eight test files, I believe those are protected, and the comparison to the overall number of lines of code is problematic: if a huge computer program had, say, 28 million lines of code (not 2.8 million), does this mean that one could copy 80 files from it? Or wouldn't it make more sense to look at what's copied and determine whether it's copyrightable in its own right? Google argues that Sun had to make Java freely available because "Sun and its collaborators, including Oracle, recognized that they could not accomplish these goals by creating another proprietary platform, which Microsoft would dwarf". Whatever Sun's motives, strategies and competitive challenges were, the primary question in this appeal is copyrightability, which is unrelated to it, and even "fair use" is different. This here is perhaps relevant to equitable defenses, and the jury verdict didn't work out well for Google in that regard. Google quotes from the district court's ruling the holding that "there is no bright line between the language and the API". Let's assume for the sake of the argument that there is no bright line. This still doesn't mean that any arbitrarily-chosen number of APIs is for the taking. It would have to be shown for each copied API why it really constitutes part of the Java language. Google then says "[t]he 'max' method is just one of many", but the majority of Java API functions are quite different from "max" in terms of the freedom Java's creators enjoyed when designing the Java APIs. Considering that a group of academics had filed an amicus brief explaining in connection with the task of drawing a circle how an API could provide different functions having the same effect, I was surprised that Google would base its appellate argument on an exceptionally simple function like "max". If I were a Federal Circuit judge and read this, I would really wonder why they don't counter what those computer science professors wrote about creative choices in API design. It looks like Google doesn't think it can win the debate if one also looks at more interesting functions than "max". But I doubt that the appeals court is going to base its decision only on a function like "max". "The district court committed no clear error in finding that the command structure of 37 Java API packages is functionally necessary (1) to achieve compatibility with programs written in the Java Programming Language and (2) to access, control, and use the Java class libraries." This is the second one of the three points I listed further above on which the appeals court might disagree with Google, in which case there wouldn't be much left of its anti-copyrightability argument. If the relevant point in time for copyrightability is when Sun created Java, then the alleged needs to achieve compatibility (didn't Apple make the iPhone a huge success without being Java-compatible?) and to access, control and use Java class libraries don't matter because they're Google's problem and didn't constrain the creativity of Java's creators. "Oracle and its amici also argue that interoperability is 'all or nothing': to achieve it, Google must implement all 166 Java packages and Android must run all existing Java programs." I'd like to know what Google would do if, for example, Samsung decided to depart from the Android standard and used some of the APIs but mostly different ones. In that event Google might suddenly become a fervent supporter of API copyrightability -- or at least regret its stance in the Oracle case. Later this week, or early next week, we'll see some filings by amici curiae supporting Google. I will discuss those filings as well. Last October an Administrative Law Judge (ALJ) of the United States International Trade Commission (USITC, or just ITC) issued a preliminary ruling holding Samsung to have infringed four Apple patents (three utility patents, one design patent). In January the Commission, the six-member decision-making body at the top of the U.S. trade agency, ordered two things: a complete review of the original findings and a limited remand with respect to additional infringements of two of the patents already found infringed. In April that limited remand resulted in a finding of additional violations by Android's text selection feature. Both Apple and Samsung requested a review of the remand initial determination. Today the Commission gave noticeof its decision to review -- in addition to the original preliminary ruling, which it already said in January it would review in its entirety -- the remand ruling as well. The final Commission ruling is scheduled for August 1, 2013. In today's review notice the Commission asked the parties ten questions. Apple and Samsung are supposed to respond to those, but not to raise other issues in their briefings. The ten questions involve three patents, two of which (the '949 touchscreen heuristics patent and the RE'922 translucent images patent) Samsung was found to infringe and the third one of which (the '697 plug detection patent) is a patent on which Apple would like to additionally prevail. The review questions don't address two of the four patents the ALJ found Samsung to infringe: the '501 plug detection patent and the D'678 smartphone design patent. While this increases the likelihood of affirmance of the ALJ's findings with respect to the '501 and D'678 patents, the outcome is by no means certain. The Commission said it would review the rulings in its entirety, and it may have identified issues on which it's comfortable deciding without further briefing. The review notice also doesn't mention the controversial question of whether the ITC has jurisdiction to rule on designarounds Samsung presented during the course of the investigation. I will report on this review in more detail when public redacted versions of the parties' forthcoming briefs become available. A week ago the United States Court of Appeals for the Federal Circuit issued its opinion in a snowplow patent case, Douglas Dynamics, LLC v. Buyers Products Company, and (among other things) instructed the district court to grant a permanent injunction it previously denied. The majority of the three-judge panel that decided in favor of an injunction includes current Chief Judge Rader, who personally wrote the per curiam opinion, and Circuit Judge Newman; Senior Circuit Judge Mayer (who preceded Chief Judge Rader's predecessor) dissented and took a Judge Koh-like injunction-skeptical perspective. The per curiam opinion on the issue of injunctive relief indicates that Apple is reasonably likely to win from this appeals court the permanent injunction Judge Koh denied in December. There are amazingly striking parallels between the reasoning of the district court that denied Douglas Dynamics an injunction and various positions taken by Judge Lucy Koh in Apple v. Samsung, and -- more importantly -- between Apple's appellate argument and the Federal Circuit's Douglas Dynamics opinion, except that no one in Douglas Dynamics (not even the dissenting opinion!) makes reference to the controversial "causal nexus" requirement, which also bodes extremely well for Apple. Earlier this month the Federal Circuit affirmed a permanent patent injunction in Versata v. SAP. Some of the court's reasoning showed that software patent injunctions are still available in the United States, but the Versata ruling is considerably less useful to Apple because, among other things, the court believed that Versata's relevant patent was central to an add-on product that SAP sells for hundreds of thousands of dollars per installation. Apple doesn't sell rubber-banding or pinch-to-zoom separately -- those are typical cases of "it's a feature, not a product". While there was a similar reasoning in Versata, the "causal nexus" term didn't appear in that Federal Circuit opinion either, which again supports Apple's claim that it was held to a higher standard than other patent holders. To the extent that Samsung was able to cite to cases mentioning a "causal nexus" requirement, those weren't patent cases, which also says something. If Judge Koh had to rule on Apple's post-trial request for an injunction again and had to apply the Douglas Dynamics logic, she would have no other choice but to grant Apple a multi-patent permanent injunction against Samsung. Apple highlights several aspects of the Douglas Dynamics ruling, but there's even more in it that supports Apple's case than what Apple's letter quotes (there's a page limit for such notices). I'll firstly summarize in bullet-point form the parts Apple emphasizes and then I'll talk about some others. Just like Samsung argued that Apple's patents cover only minor feature of complex multi-feature products, Buyers Products had argued that (in the Federal Circuit's summary) the patents-in-suit "cover[ed] only some components of the accused [products]". Still, the appeals court determined that an injunction was appropriate, for a variety of reasons that also apply in the Apple-Samsung case. Presumably there's a much smaller number of patentable inventions in a snowplow than a smartphone, but today's snowplows are probably also quite advanced. The key thing is that patents and products aren't coextensive in either case. "Irreparable injury encompasses different types of losses … including lost sales and erosion in reputation and brand distinction"
"Where two companies are in competition against one another, the patentee suffers the harm—often irreparable--of being forced to compete against products that incorporate and infringe its own patented inventions." It's hard to think of a sentence that would better describe Apple's situation vis-à-vis Samsung. Closely related to the previous item is the holding that "mere damages will not compensate for a competitor’s increasing share of the market, a market which [the patentee] competes in, and a market that [the patentee] has in part created with its investment in patented technology". "While the general public certainly enjoys lower prices, cheap copies of patented inventions have the effect of inhibiting innovation and incentive. This detrimental effect, coupled with the public’s general interest in the judicial protection of property rights in inventive technology, outweighs any interest the public has in purchasing cheaper infringing products. In sum, the public has a greater interest in acquiring new technology through the protections provided by the Patent Act than it has in buying 'cheaper knock-offs.'" "Although 'the parties here compete for sales of snowplow truck assemblies, along with a number of other manufacturers,' the district court found that Douglas suffered no injury because Douglas failed to show it was losing sales or market share to Buyers. The district court relied on evidence that persons willing to pay for a Douglas snowplow were unlikely to purchase a Buyers snowplow as a substitute, and that Douglas's market share increased about 1% a year after Buyers introduced its infringing snowplows." "The Mercedes would lose some of its distinctiveness and market lure because competitors could contend that they had 'similar features' without noting that those features infringe Mercedes's proprietary technologies." I've said all along that what Apple wants is distinctiveness, and you can only be distinctive if you can, if necessary, obtain injunctions to prevent someone from copying you. "Stated differently, even with a Ford Taurus announcing that it possessed similar features on the market, Mercedes could maintain or increase its market share for a variety of reasons." Even though Judge Koh's order denying a permanent injunction concedes some of this, the key question is what the appropriate consequence should be. Judge Koh, relying on an extremely demanding application of the outlier "causal nexus" requirement, concluded that Apple wasn't entitled to an injunction. Chief Judge Rader, however, granted Douglas Dynamics an injunction. "The district court also made a clear error of judgment in its analysis of Douglas's reputation loss. The district court found that Douglas had a reputation as an innovator, yet determined there was no injury because there was no evidence that interested consumers confused the two companies. Even absent consumer confusion, however, there can still be harm to a company’s reputation, particularly its perception in the marketplace by customers, dealers, and distributors. As just one example, Douglas's reputation as an innovator will certainly be damaged if customers found the same 'innovations' appearing in competitors' snowplows, particularly products considered less prestigious and innovative." Apart from the last seven words -- the "particularly" part -- you could simply replace "Douglas" with "Apple". By now, Samsung's products aren't "less prestigious", but most consumers still know that Apple, not Samsung, revolutionized the mobile phone business. "The question is not whether Apple could be adequately compensated by a narrow, voluntary license to a non-competitor. Instead, the court must ask whether an unrestricted compulsory license to Apple's primary direct competitor is an adequate remedy. The answer to that question is clearly no." In addition to differences of major commercial significance between the deals Apple struck and the "deal" Samsung wants from the courts, I also believe Apple can overcome the licensing issue for policy reasons: the Federal Circuit won't want to disincentivize settlements and license deals. It wouldn't make sense to apply the eBay injunction factors in such a way that a company has to categorically withhold licenses. "More relevant is the rise in Buyers's market share from zero to about 5% in three years while infringing Douglas's patents. This record evidence underscores the profitability of infringement and suggests that mere damages will not compensate for a competitor's increasing share of the market, a market which Douglas competes in, and a market that Douglas has in part created with its investment in patented technology." Douglas Dynamics is an enormous boost for Apple's aspirations to win an injunction against Samsung, not only over the multiplicity of intellectual property rights a federal jury found infringed last summer but also with a view to next year's trial over other (generally more impactful) patents, where Apple may very well obtain additional infringement findings based on recent claim construction results. And it's not just about the patents Apple asserts in court. The availability of injunctive relief is going to have a major impact on the terms of the settlement that Apple and Samsung will for sure reach at some point, though no one knows when. Judge Koh always urged them to settle, but if she had adjudged Apple's injunction request differently, we might already have seen a settlement. Now it's up to the Federal Circuit, whose Chief Judge has just taken a number of positions that are fantastic for Apple's strategic purposes. A couple of weeks ago Apple filed a copy of Judge Robart's FRAND rate ruling with the Federal Circuit and explained why it believes this supplemental authority supports its case in the "Posner appeal". On Friday Google's Motorola replied to Apple's notice. Google's primary position is that the Microsoft v. Motorola FRAND rate ruling in the Western District of Washington is "inapposite to [the Posner appeal] because it purports to set a FRAND rate to license a different class of products involving different patent portfolios and different standards and arises in a purported contract case that does not involve infringement damages". The differences in products, patent portfolios and standards are, of course, unrelated to overlaps of the issues. Apple didn't claim that Judge Robart has determined the proper license fee Apple would have to pay for Motorola's cellular standard-essential patents (SEPs). And while it's true that the Seattle case is a contract case, the rate-setting decision applied a methodology from the realm of patent damages -- the Georgia-Pacific factors. Toward the end of the filing, Google notes that "the patent pools analysis [Judge Robart] used [...] is not at issue [in the Posner appeal]." "ex ante incremental value at the time of standardization may be helpful in determining a FRAND rate but is only one factor in the analysis"
"Georgia-Pacific requires a hypothetical negotiation at the time of first infringement"
"only certain Georgia-Pacific factors may be relevant to a given case [...]--especially 'customary practices of businesses licensing [F]RAND-encumbered patents'"
"comparable 'real-world' licenses are relevant to hypothetical negotiation analysis"
"The Decision acknowledges that Motorola's wireless cell phone portfolio is 'extremely strong.'" "acknowledges that FRAND rates can be higher than pool rates"
It's an additional validation of Judge Robart's comprehensive and balanced approach that Google isn't fundamentally opposed to all key aspects of his methodology, though I'm sure it's unhappy about the result in that particular case. In my detailed commentary on Judge Robart's ruling I had also noted that he agreed with Google's Motorola on a lot of items, including the selection of the governing framework (Georgia-Pacific), and I discussed the differences between his approach and that of Judge Posner (which is not to say that one is superior over the other, but Judge Robart's reasoning will be more difficult to attack in its entirety on appeal). They don't explain away the most important aspect of Judge Robart's FRAND rate ruling, which is that it's a proof of concept for the notion that FRAND disputes should be resolved through court determination of license fees rather than injunctive relief or any other form of extortion. The specifics of each case are different, and I, too, acknowledged that Judge Robart's case-specific decision can't serve as a blueprint for every FRAND rate dispute out there. But the fact of the matter is that the first FRAND rate determination made by a federal court has worked out very well, and there's no indication that other cases can't be resolved the same way. Items 1 and 2 (the numbering is mine) relate to Google's primary criticism of Judge Posner's approach to license fees: timing. But I wouldn't overstate the difference between Judge Robart and Judge Posner's approaches, and I'm not sure it makes a different of even one cent of royalties in the Apple-Motorola case. Judge Posner basically says: "Your SEPs are worth what they were before they became SEPs (value of 'patent qua patent'), but anything above and beyond that is hold-up value which I won't give you". Judge Robart effectively says: "I'll assume that you negotiated when the alleged infringement began, but I'll also assume that you both negotiated in full awareness of the fact that hold-up value in terms of value the patent didn't have prior to standard-setting must be excluded." As for items 3 and 4, I don't think Apple would even disagree that if a FRAND rate is set according to Georgia-Pacific (which is not its preference), some factors don't apply. With or without FRAND it's probably hard to find a case in which all 15 factors apply. But it's definitely good for Google that customary licensing practices and comparable "real-world licenses" are among the ones Judge Robart considered relevant. However, in the Microsoft v. Motorola case those customary practices also included patent pools, which Google didn't like. Also, if a rate isn't FRAND, it isn't FRAND regardless of whether it can perhaps somehow be reconciled with customary practices. The customary licensing practice Google likes best is the one of many deals involving royalties relative to an entire product as opposed to, for example, a component like a baseband chip. In the past all phones were just phones, apart from minor differences in terms of address books etc., while nowadays there's a distinction between feature phones and portable computers, i.e., smartphones/tablets. Apple changed this, and Apple reasonably argued in a different but related context that a jalopy and a new sports car pay the same highway toll. Furthermore, there's a difference between what results from free-form negotiation vs. a simulated negotiation in a restricted scenario. Most license deals involve SEPs and non-SEPs at the same time, and there's nothing wrong with this if it's what the parties agree on, without one party coercing the other into a deal. But in a FRAND dispute it's necessary to set a separate royalty only for SEPs because SEPs, unlike non-SEPs, must be licensed. If parties can't agree on a FRAND rate and a court must set it, then I think the only practicable approach is to focus on the smallest salable unit. One more thing about item 4: one of Google's problems in the Microsoft case was that the license deals it presented weren't deemed comparable. Some involved completely different patents (which Google now also claims with respect to Apple's citation to Judge Robart in the Posner appeal), and others did involve some or all of the relevant ones, but also related to many others. Part of the reason is what I just explained: there's a structural difference between the results of most voluntary negotiations and those of simulated negotiations for the purpose of setting infringement damages or FRAND rates. I've criticized certain "baseball arbitration" proposals in the FRAND context (which don't even correspond to what is actually done in baseball when a non-free agent is involved), and those who argue that there would be enough real-world license deals in place to indicate a FRAND range don't consider that decisions in FRAND disputes will result in FRAND-only rates while real-world settlements will most of the time also involve non-SEPs, which in turn makes them much less useful, or in many cases entirely useless, as comparables in subsequent FRAND disputes. A single non-SEP can be more valuable than a large number of SEPs because it owner usually doesn't have an obligation to license it. Besides usually involving non-SEPs, deals between major players are typically cross-licenses and then it's hard to figure out how valuable a particular party's portfolio was in the eye of the parties. By contrast, decisions like the one Judge Robart made contribute to the development of relevant case law and deliver "clean" results ("clean" in terms of not involving non-SEPs, cross-licensing etc.). Item 5 -- Judge Robart's extremely favorable comment on the strength of Motorola's cellular SEP portfolio -- is the only thing in Judge Robart's decision that I disagreed with. But Google has every right to get mileage out of it. Regarding item 6, it's true that Judge Robart agreed with Google that FRAND rates can be higher than pool rates, but under the specific circumstances of that Microsoft v. Motorola case, the difference wasn't much. It amounted to a few hundred thousand dollars per year, which is negligible in the context of a license deal with the world's largest software company and a leader in the gaming console business.